Those little shoulder straps always make me think of military jackets. This jacket has flapped breast pockets. This shirt is actually olive green, but it appears brown on camera. In Sin City (3x04), Dean wears this jacket when he questions Casey about Ritchie and eventually leads her back to her wine cellar where they get trapped. He changes out of it after Sam rescues him. In Hammer of the Gods (5x19), Dean wears it for the entire episode. In All Dogs Go To Heaven (6x08), Dean wears this coat, whenever he is not in a suit, from the beginning of the episode until they shoot all the Skinwalkers. He only takes it off when he is inside the motel room. In Unforgiven (6x13), Dean wears this coast when he and Sam leave the restaurant, and Dean tries to pack them up and get them out of town, only to be convinced by Sam to stay and work the case. He wears it for the rest of the episode, only taking it off when he has to wear a suit, and when he tries to convince Sam yet again to leave but is denied and helps Sam with the research instead. He is wearing it at the end of the episode when Sam collapses. In Mannequin 3: The Reckoning (6x14), since it picks up where we left off, Dean is still wearing this coat as Sam comes to. He continues to wear it as they leave town, stop for food, and Dean finds their next job. He then changes to a different coat. In Meet the New Boss (7x01), Dean wears this coat when they break into the mansion and summon Death. He then wears it again at the end of the episode when they take Cas back to Crowley’s lab to try to get rid of the monster-souls. In Time After Time (7x12), Dean wears this coat on the stakeout with Sam where he first encounters Chronos and is zapped back in time. He changes out of it once Elliot Ness brings him to a clothing store to get him some proper 1940s clothes. old navy has one like this right now, brown and balck! Can anybody tell me the whereabouts of this jacket? I mean, there must be more than a dozen or easily more out there? I'm sure people sell them now and again. Your best bet is probably to keep an eye on ebay or other such second-hand sites. Sorry I can't be of more help, but I just document, I don't collect, so I've never had to worry finding the clothes or purchase. Ahh, that's cool/understandable. I'm looking for his Wilson Car Coat and this brown one ^ So I guess, I best carry on looking around. I know it's going to take time. Do you know what episode it's seen in? If it only appears in S9, then I wouldn't have it documented here - but if it appears in an earlier season, I'd like to know so that I can add it in. It's the Dream/Djinn episode, where Dean has been taken basically at the beginning and I think the only reason Dean has this jacket, is because he bought it/got it in his dream world, maybe from his illusion/imaginary wife. He wears it mostly in his dream, apart from when he wears semi-formal apparel and comes back to the real world. I don't think I've ever seen it in any other episode. I don't think people catch on to it, or you have because if you don't pay attention, then you just think, "Oh, another brown military jacket, he likes those few he has." He has quite a lot of brown military jackets, it seems and from owning this one I've researched; I can vouch for it and say, It's a beautiful jacket to look at/to put on and the suede leather feels great. I hope my research has helped, would I be rude to ask if I could be put in the description for this jacket, as helpful/credited? If not, I understand, thank you. Oh! Right... originally, when I started documenting the clothes, I decided to ignore all clothes worn in "dream states" or "alternate realities" - which is why I don't have any entries for the clothes that Sam and Dean wore in the Djinn-dream. Like-wise, I didn't add any clothes that End!Dean wore in The End... 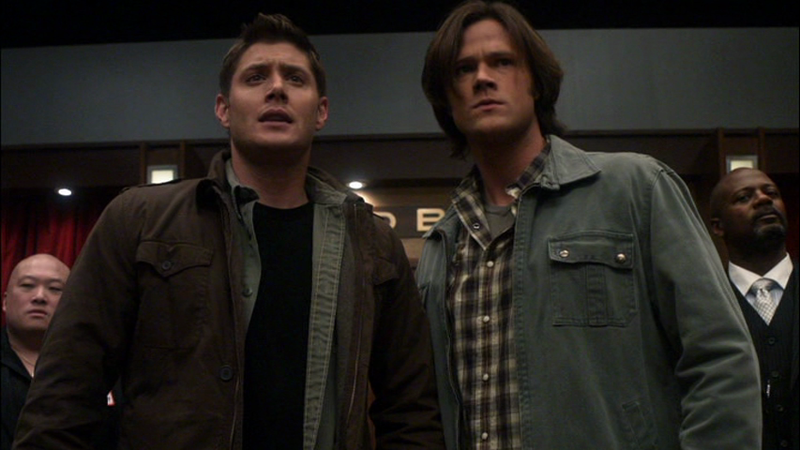 BUT, then in 5x18, Dean wore the same jacket that End!Dean wore in The End, so I DID end up having to put it in. So, the new rule became that I would only add clothes worn in alternate realities or dream-states IF they appeared in non-dream states as well. I have gotten another request to add that jacket - so I'll go back and look at it, but I'm still reluctant to add it unless I see that it's a jacket that Dean actually owns in reality. Anyway, if I do end up adding it, and you can give me brand info and such, then I could add you in as being helpful, no worries.